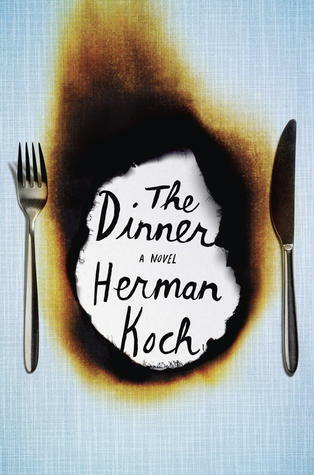 Herman Koch's The Dinner is an ethically conflicted novel. How far into "we just want the best for our son"? It actually makes me a little ill (indigestion?) to contemplate my reaction, my horror, if my son committed a senseless act of violence.... the source of the discord in The Dinner. The Dinner is a gourmet meal. Tiny bites of food = tiny details of information. A simple setting, a recognizable group of people. Two brothers, their wives, all of them parents to teens. Meeting to discuss what to do next about their sons' transgression. Eating at one of the finest restaurants in the city. It's only AFTER the violent act is revealed (the act that's driving this "meeting" of the two families) that Paul (one of the dads, and the narrator) begins to reveal, in his mind, and in reflection, of how mentally troubled he has been... for years. His denial (the house isn't really THAT messy, my little son isn't really THAT dirty) is indicative that, in fact, things are very, very wrong. The language and style of this book are outstanding, and I have a clear mental image of each of the characters - but not through long descriptions of their appearance. It was the pacing of the dialogue, or how they ate, or didn't eat, that revealed who they are. I enjoy books with a small setting (a room), and an even narrower time-frame (except for Paul's flashbacks, this novel takes place over the course of a single evening). The Dinner would work very well as a play. It's probably already been optioned as a film. I was so horrified by the act of violence that I had to put the book down for weeks. Otherwise it would have been a quick read. By the end, though, I was more horrified by the parents' response - the limitless, amoral "we only want the best" approach. I dearly hope I am never tested. Note: I received a review copy of The Dinner from the publisher. I'm putting this book at the top of my 2013 reads. A disturbing and fascinating read. I enjoyed how my opinion of the characters changed as I read on.